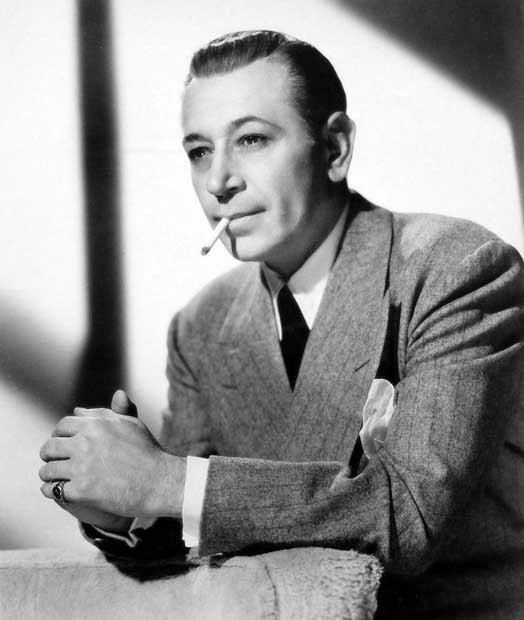 Whether George Raft or Frank Sinatra was more often linked with the Mafia is a tough call. A small-time hood turned successful movie gangster, Raft's first association with a big-time hoodlum was with the charismatic Bugsy Siegel. Bugsy had been sent to Los Angeles in the late 1930s by the East Coast crime families to develop their national gambling empire and to lay the groundwork for their eventual colonization of Las Vegas. Siegel was taken with Raft's portrayal of the coin-tossing gangster in Scarface, a character Siegel viewed as the mirror image of himself. The pair became inseparable, seducing starlets by night and betting the horses heavily at Santa Anita racetrack by day. When Siegel opened the glittering Flamingo Hotel in Las Vegas in December 1946, Raft was an honored guest and reciprocated by greeting other movietown figures. But the Flamingo was an instant flop, showing no sign of its future glory. Siegel, who had skimmed off hundreds of thousands of dollars of mob money advanced for construction purposes, was murdered. Raft took the demise of his favorite gangster very hard, so hard, in fact, that a tenderhearted Meyer Lansky, who rather obviously had had to give his okay for the Siegel hit, felt he had to do something to ease the actor's grief. He soothed Raft with a job as a sort of superior toastmaster at his Capri Hotel in Cuba. It was the beginning of Raft's career as a super shill for the mob, an occupation that grew as his movie career faded. Raft proved enormously important to the mob, far more than his compensation reflected. When the mob built the Sands in Las Vegas, Joseph "Doc" Stacher, one of Lansky's closest associates, saw the importance of the Hollywood connection. As he later explained in retirement in Israel: "To make sure we'd get enough top-level investors, we brought George Raft into the deal and sold Frank Sinatra a nine percent stake in the hotel." Inevitably, Raft was marked as an associate of underworld characters. Accordingly, the authorities began to create some domestic problems. Even the Communist authorities made it hot when, in the case of Havana, Raft lost out as Castro came to power and routed the Lansky-Batista combination that ran the casinos. In the 1960s, the elderly Raft became a star of the London scene, playing the operator of the Colony Sports Club, a sort of Rick in a real-life Casablanca. (Raft ironically was the pre-Bogart choice for the part). The Colony was a plush place, controlled by Lansky and his frequent associate in casino operations, Dino Cellini. It quickly became the "in" place to go for English and visiting society. Raft was always in the limelight, appearing each evening in a tuxedo, meeting people, signing autographs, and dancing with awed women. Later Raft would confide to friends that his days at the Colony were the happiest of his life. As he put it to informer Vinnie Teresa, "Vinnie, those were the best days I've had in years. I had a chauffeured Rolls-Royce, beautiful women with me every night, a beautiful penthouse apartment in the Mayfair area, and five hundred dollars a week. Who lived better than I did? What did I care about what was going on in the casino every night or who was involved? I never did anything wrong." Whether Raft did anything wrong or not finally meant little to British authorities, who decided he was fronting for mobsters. Making him the scapegoat, they deported him from the country. After that Raft tried for shill jobs both at home and abroad, but in due course he was subjected to the same sort of official disapproval. Raft in time became poison to the mob, and eventually he was finished as both an actor and a casino shill. Raft had made millions for the mob, and Teresa was later to call him "the best investment Lansky and Cellini made" in England. With a recommendation like that, it was perhaps inevitable that Raft died broke.